Bihar has a very long history. Here one of the most advanced civilizations flourished which is comparable to any of the contemporary civilization of that time. Beginning around the fourth century BC the Mauryan Dynasty flourished under different Mauryan Monarchs for around 140 years followed by the Gupta Dynasty, who also ruled for another 200 years. "Bihar" has been derived from the word "Vihar" which was symbol of Buddhist monasteries. 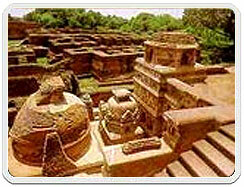 Bihar is one of the places which has seen the birth of ancient civilization and Indian history. Hindu, Buddhist, Jain, Muslim and Sikh Shrines abound in this ancient land where India's first major empire rose and fell. It is land of not only the religious preachers but also of Emperors and big warriors. It had four Kingdoms: Mithila(Videh), Vaishali Ang and Magadh. Videh: During Vedic days Videh was ruled by Janak vanshi kings and Raja Janak,"Sita's" father who was one of the kings. During 6th century B.C. this place had the first elected republic of the world. During the course of time, eight small republics were formed which later on merged with Lichhavi State. Vishal the son of Surya Vansha formed the Vaishali state. During 6th century B.C. Vaishali became a republic state. This state was established by a prince named Angad. Full details of this state is not available in the history except that Ang king married his daughter to Kaushambi king Udayan to save his kingdom from Puruthan the king of Magadh. Still this Kingdom could not be saved as Bimbisar of Haryak vansh conquered Ang and merged it with Magadh. The area of Patna and Gaya constituted the ancient Magadh kingdom having it's capital at Rajgrih. Barahyadrath, father of Jarasandh established the Magadh kingdom in 6th century B.C. Later on Bimbisara became the ruler of Magadh. Bimbisara and Ajatshatru expanded their Kingdom covering northern Bihar. Thereafter Shishunag became the ruler and conquered Awauti state. During 4th century B.C. Ugrasen of Nand Vansh became the ruler, who was dethroned by Chanakya and his disciple Chandragupta. Chandragupta was a great warrior who forced Sikander to leave India and also conquered Afghanistan & Baluchistan and made it a part of his kingdom. Chandragupta was succeeded by Bindusar and then by Ashoka the Great, who ruled from 273 century BC to 232 BC. King Ashoka became the follower of Buddhist religion after he attacked Kaling in which 1 million people were killed and 1.5 million people were taken as prisoners. He spread Buddhism throughout the world. Histories of next 500 years are not of great importance. From 26th Feb 320 AD rule of Gupta regime started and Chandragupta first became the king. He made Patliputra his kingdom and ruled till 330 AD. His son Samudragupta ruled from 330 Ad to 380 AD. And degeated 12 kings of south and became famous throughout the world. Samudragupta's son Chandragupta Vikramadutt became the ruler from 375 AD to 493 AD and conquered Gujarat, Kathivada & Ujjaini. The great poet Kalidas was one of the Ratna's of that period. Maukhri Vansh ruled Bihar for some time followed by Harshvardhan, Sashank & Adityasen. During 743 AD Palvansh ruled Magadh and the ruler were Gopal, Dharampal and Deopal. After the death of Deopal the kingdom started disintegrating. During 1236, Muslims attacked Bihar but Shershah Suri (1472-1545) brought stability again. Akbar, the great made Bihar a separate state consisting Magadh, Tirhut and Ang . Suja became the Governor of Bihar. In 1652 the British started business form Patna and after Palasi war they started ruling Bihar . The British ruled Bihar from 1765 to 1947 and thereafter Bihar became a state under the Union of India. Bihar state (2001 provisional pop. 82,878,796), 36,420 sq mi (94,328 sq km), E central India. Bihar is bounded by Nepal (N) and by Indian states-West Bengal (E), Jharkhand (S), and Uttar Pradesh (W). Bihar is a rich agricultural area, crossed by the Ganges River. Rainfall, frequently inadequate, is supplemented by irrigation. Rice is grown where possible; corn, wheat, barley, sugarcane, tobacco, and oilseed are important crops. Jute is the main cash crop in the east. Bihar is mainly a vast stretch of very fertile flat land. It has several rivers: Ganga, Son, Bagmati, Kosi, Budhi Gandak, and Falgu to name a few. Central parts of Bihar have some small hills, for example the Rajgir hills. The Himalayan mountains are to the north, in Nepal. To the south is the Chota Nagpur plateau, which was part of Bihar until 2000 but now is part of a separate state called Jharkhand. Bihar is mildly cold in the winter (the lowest temperatures being around 5 to 10 degrees Celsius; 41 to 50 degrees Fahrenheit). There are three well-defined seasons: the hot-weather season, lasting from March to mid-June; the season of southwest monsoon rains, from mid-June to October; and the cold-weather season, from November to February. May is the hottest month, with the mean temperature exceeding 90 �F (32 �C), except in the extreme north and the plateaus of Ranchi and Hazaribag. 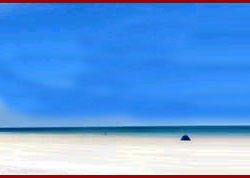 (Because of its agreeable climate, Ranchi city has historically served as Bihar's summer capital.) The normal annual rainfall varies from 40 inches (1,016 mm) in the west-central part to more than 60 inches (1,524 mm) in the extreme north and in the southwest. The rainfall on the plateau-more than 50 inches (1,270 mm)-is heavier than on the plains. Nearly all the rain (85-90 percent) falls between June and October, and nearly 50 percent of the annual rain falls in July and August. The cold-weather season is the pleasantest part of the year. Air: Bihar has an airport in its capital city Patna, which is linked by air with Delhi, Mumbai, Lucknow, Kolkata. Katmandu, the capital of Nepal also has normal flight connection to Patna. Major airlines of India, namely: Indian Airlines, Sahara Airlines operate usual flights to and from Patna. Rail : A large number of major and minor places within the state are networked by train services of Indian Railways. Even the state is serviced by important super fast trains like Rajdhani Express and Shatabdi Express. Road : An extensive network of National Highways Nos: 2, 23, 28, 30, 31, and 33 and state highways, running through the state, connect it with important cities all over India. Internal road network within the state connects Patna to Vaishali (55 km), Nalanda (90 km), Bodh Gaya (110 km) and other tourist destinations.